Checking out the chicken at opening reception for the Chilmark Gallery. 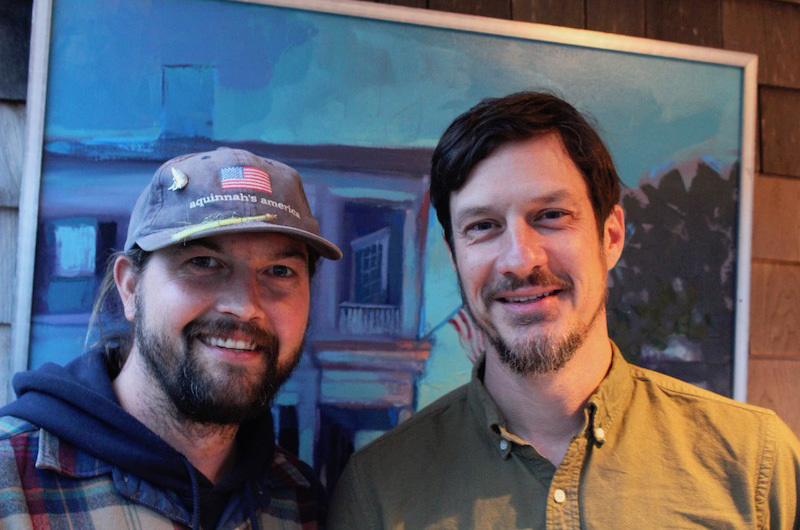 Edgartown artist Brandon Newton was painting in Menemsha last summer when he heard a car horn blaring behind him and someone shouting his name. It was Aquinnah artist Abe Pieciak, who was looking for a partner in a new gallery venture. The two were fans of each other’s work but knew each other only in passing. They decided to go on a fishing trip together to see if they would make a good team. On the trip a shooting star appeared and a large striped bass was landed. Mr. Pieciak said the idea to open a gallery began germinating when a space became available next to the Chilmark Tavern. Finding a partner in Mr. Newton was the final piece of the puzzle. The pair set to work designing the space and recruiting Island artists who would fit the homegrown aesthetic. They turned around the space in five months, filling it with pieces from artists they admired along with a few of their own signature works. 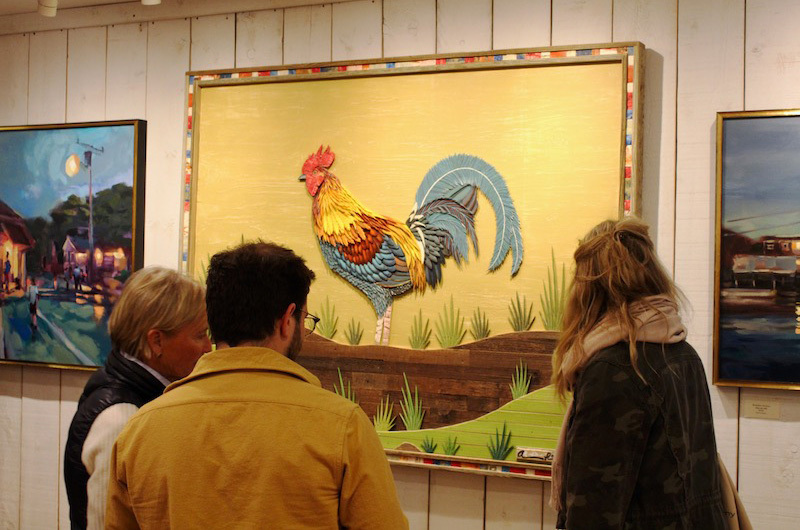 On opening night the gallery was filled with art lovers for an exhibition that included watercolor paintings, cutting boards, lures, mugs and one very large chicken made from small pieces of wood. There was no theme, just a requirement that all pieces in the gallery be handmade, even the outdoor bar with a chalkboard made out of driftwood. “They’re unique artists that you don’t see too much on the Island and that you may not know about,” said Mr. Pieciak. Liz Ragone, who along with Brad Tucker manages Mill and Mason, a new Island woodworking venture in West Tisbury, displayed a table the couple had crafted. She said it was an honor to be included in the gallery and to connect with the other artists. “It’s the most amazing group of people. Everyone’s already planning to get together,” she said. Zach Pinerio, another woodworker who makes bowls from reclaimed Island wood in his studio on Chappaquiddick, echoed Ms. Ragone’s sentiments. Some visitors to the opening said they were now inspired to begin their own projects. Mr. Newton said that was a goal, to help people pursue their own artistic passions. “This was something that was a dream and a feeling and emotion,” he said. “This is bigger than us, bigger than anyone,” added Mr. Pieciak. The Chilmark Gallery, located at 9 State Road in Chilmark, will be open seasonally through the spring on Friday, Saturday and Sunday from noon to 5 p.m. I am so proud of Brandon and his success! Brandon's use of silhouette, color, and light make his paintings unique and impactful. I wish him all the best in his new endeavors in Virginia and on MV. Brandon's vision is so beautifully depicted in his paintings. Seeing his scenes of MV takes me back to some of the greatest aesthetic experiences I have ever had. Seeing his painting of Menemsha beach brought back the sound of the applause (and laughter at the applause) that occurs there at sunset. The sounds of quick kisses and glasses clinking in toast to a beautiful end of the day at one of the best places on earth. One of the highlights of my life in one of his paintings! Love it! This is such a beautiful sentiment. I love the part about Menemsha sunsets. Enjoyed a few there with my Newton family. Welcome!!! the more art the merrier. To be clear, the gallery will NOT be open in the summer?